Taiwan's President Tsai Ing-wen on the phone with US president-elect Donald Trump at her office in Taipei. AS A CANDIDATE and a president-elect, Donald Trump has compiled a long list of follies, gaffes, and outrages. His phone conversation with Taiwan's president isn't among them. 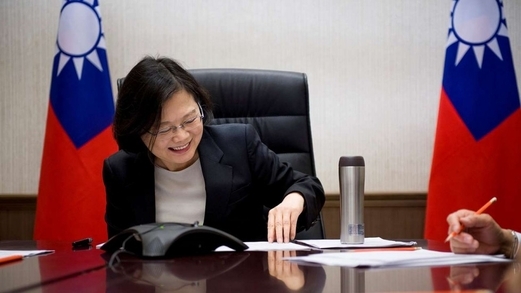 Trump's few minutes on the telephone Friday with Tsai Ing-wen, who phoned by prearrangement to congratulate the incoming US chief executive, sent the foreign-policy establishment into meltdown mode. For the first time in nearly 40 years, an American president or president-in-waiting had spoken directly with his Taiwanese counterpart, and the reaction in many quarters was hysteria. "These are major pivots in foreign policy w/out any plan," tweeted an alarmed US Senator Chris Murphy of Connecticut. "That's how wars start." In truth, wars are made more likely when the United States attempts to appease powerful and dangerous aggressors at the expense of weaker but peaceful allies. For eight years, President Obama has largely pursued such a foreign policy, bending over backward to accommodate brutal regimes — in Iran, Russia, Cuba — while ignoring or abusing friends from Kiev to Aleppo to the prison cells of Havana. The result has been a world more violent, fanatic, and unstable. For years, under presidents of both parties, Washington has gone along with China's demand that Taiwan be marginalized and embarrassed in the international arena. Taiwan is denied membership in the United Nations, the International Monetary Fund, and the World Bank, for example. Its Olympic athletes are not permitted to compete under their nation's proper name or flag. Last month Taiwan was denied permission to attend the annual meeting of Interpol, the international criminal police organization even as an observer. These exclusions are shameful in their own right, and they retard American interests in the Far East by encouraging China to advance its goals through bullying and intimidation. If Trump's gesture last week signals that the United States will no longer collaborate in the snubbing of Taiwan, foreign-policy realists should be the first to applaud. Creative fictions have their place in diplomacy, but the so-called "one-China" policy is a good example of one that years ago outlived its efficacy. There was a time when Beijing and Taipei each claimed to be the sole legitimate government of both the Chinese mainland and the island across the Taiwan Strait. It wasn't factually true, but American policymakers found it useful to pretend otherwise. Thus, from 1949 to 1979, Washington maintained the diplomatic charade that China's rightful government was in Taipei. In 1979 the US position was reversed under Jimmy Carter; the fig leaf became that Beijing was the authentic government of "one China." In the wake of a savage civil war that left both mainland China and Taiwan ruled by dictatorial regimes vowing to destroy each other, America's "One China" posture may have been defensible. But it has been 67 years since Chiang Kai-shek's flight to Taiwan, and his authoritarian regime is a dusty memory. Taiwan is now a free and democratic republic, a thriving nation in which human rights are protected, civil liberties enforced, and freedom of conscience guaranteed. It is a trustworthy American ally and our 10th-largest trading partner; its intentions toward China are those of a respectful and peaceable neighbor. Taiwan, a thriving democracy, is a robust trading partner of the United States. In every respect that matters, Taiwan is a sovereign, independent, civilized nation. There should be no hesitation about saying so — not by Taiwan, and not by its friends. The kowtowing to Beijing should have ended decades ago. Yes, Trump's protectionist trade rhetoric toward China (and other countries) is deplorable, and Congress should staunchly resist his threats to impose choking tariffs on Chinese exports. But it should just as staunchly encourage Trump to normalize relations between Taiwan and the United States. The "One China" sham is obsolete. A full-fledged diplomatic mission — not a back-of-the-bus "economic and cultural office" — should represent Taiwan in Washington. High-level American and Taiwanese officials should be welcomed as guests in both countries. The State Department should press for Taiwan's admission to the UN and other international bodies. The new president and defense secretary should appear together at the Pentagon early next year to confirm that America's commitment to Taiwan's defense — a commitment mandated by the Taiwan Relations Act more than 35 years ago — is unwavering. No more fig leaf. Beijing may be the sole legitimate government of China, but China stops at the Taiwan Strait. There is one China and one Taiwan. Let's all stop pretending otherwise.